FOX has issued the press release for an hour-long showing of Brooklyn Nine-Nine on Sunday, April 15 with the episodes "NutriBoom" and "DFW". Jake Chandrasekhar (Super Troopers), Christine Garver (Mad Men), and Nassim Pedrad (New Girl) guest star in the episodes. Jake and Charles realize that they've been suckered into the cult-like NutriBoom pyramid scheme, and must find a way to sever their contracts. 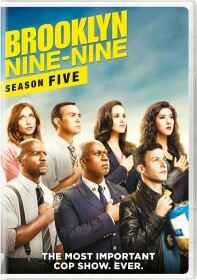 Then, Jake invites his newly discovered half-sister (guest star Nasim Pedrad) to stay with him in New York, but when he and Amy realize she's a bit of a nightmare, they must find a way to get her back home to Dallas in the all-new "NutriBoom/DFW" special one-hour episode of BROOKLYN NINE-NINE airing Sunday, April 15 (8:30-9:30 PM ET/PT) on FOX.